I’m back from London! I picked up some vintage lovelies of the leopard print and rhinestone persuasions at Portobello Market, will post photos soon, but there’s so much to do before winter arrives! There’s wood to stack and supplies to procure. The other day, I was riding home with 10 kilos of cat food on the back of my bike, the weight shifted, and the basket flipped off the back. Luckily, it was only raining. On ice, it would’ve been much worse, so it’s definitely a good idea to stockpile the heavy things before the ice comes. 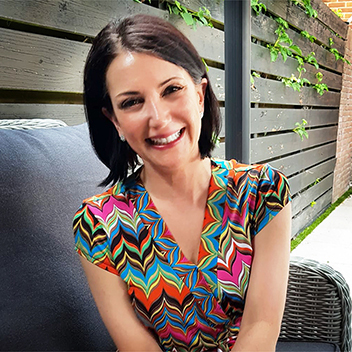 Last month, my Turkish friend (and London travel buddy) invited me for lunch, and she served the most delicious lentil dish! She was nice enough to translate the recipe for me, and now I’m sharing it with you. 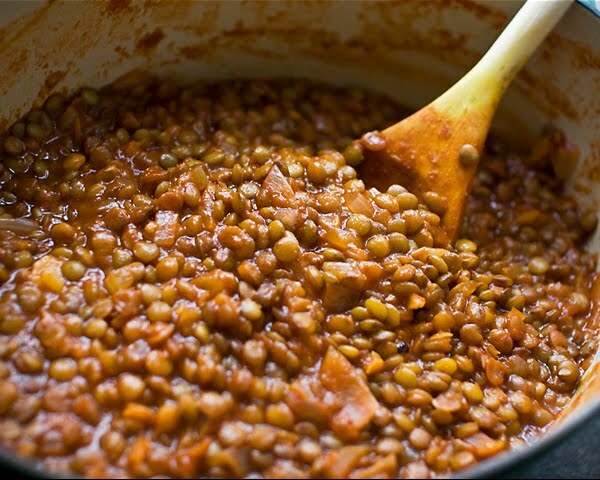 Wash the lentils and add them to a pot of boiling water. Boil them for 3 minutes or so, then reduce the heat to a simmer and cook them until they begin to soften. I cooked mine for about 15 minutes, but the cooking time will vary based on the age of your lentils. You’re going to cook them again, so they should still be firm at this point. Drain them. In a large pot, sauté the onion in the olive oil until it begins to soften, sprinkle it with the flour and continue to sauté until the flour begins to brown. Add the lentils, tomato paste, and enough water to cover the lentils. Add the cumin, a bit of salt, and a bit of hot chili powder. Bring it to a boil, then reduce the heat and simmer 15-20 minutes, or until the lentils are tender and most of the water is absorbed. This looks almost identical to the recipe I used in my first attempt at cooking lentils. It is a fabulous recipe! 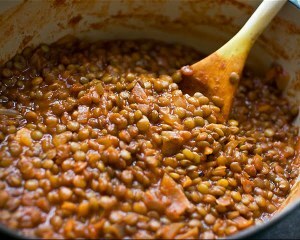 I love lentils and am going to have to make them tonight after reading your post. Thanks for the fabulous temptation. I cooked this recipe for dinner tonight – it was a hit! This dish is in heavy rotation at Chez Sage, but let’s face it, one batch is enough to feed me for a week! One batch makes a whole lotta lentils indeed. I froze the leftover lentils, and recently added them to a soup, along with onions, pumpkin, kale, and a dash of chili garlic sauce. I got quite a few meals out of that recipe. Thanks again for all the wonderful recipes, stories, and photos! I’ll be making that Korma recipe soon as well.